Home / Tempted by tennis? With Eastbourne and Wimbledon tennis tournaments just around the corner, more people will be tempted to pick up a racquet to get fit. It’s a great exercise for all ages, but if you’ve never played, or it’s been a while since you last played, Steve Daly, Extended Scope Practitioner, has provided some tips to help you get to grips with the sport and avoid injury. As with any form of exercise or sport, it’s important to warm up your body gradually. Starting off gently gets the blood pumping to your muscles, increasing the flow of oxygen and preparing them for activity. This is particularly important for a sport like tennis which involves lots of sprinting, leaping, stretching and pivoting. These abrupt movements put a lot of sudden and unaccustomed pressure on muscles and ligaments and can cause the tissues to tear, but muscles that are warmed-up are more pliable and therefore less prone to injury. Tennis elbow is the injury that everyone’s heard of but elbows are not the only tennis injury. Ankles, knees, shoulders and wrists are all prone to injury if not warmed up properly. It’s important to do some gentle stretches to the muscles around all of these joints and also practice things like hopping and jumping from one foot to the other to test your balance and warm up your legs. Over-doing it on your first game may mean that it is also your last. If you are tired you are more likely to lose focus and co-ordination making you more prone to hurting yourself. Take regular breaks and build up the length of play over a period of time. It’s essential to wear good quality trainers. They don’t need to be expensive or even specially for tennis but they should fit properly, and be supportive and cushioned to help protect your joints from the impact of running and jumping. And don’t forget to tie them securely – a surprising number of injuries are caused by tripping over laces! Our bodies don’t work without water: its functions include cooling us down, assisting blood flow and lubricating the joints with synovial fluid. You will lose a significant amount of water during a game of tennis particularly if the weather is warm. Make sure you have had plenty to drink before you start playing and have a bottle or two of water courtside so that you can top up regularly. 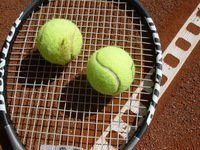 Although a lot of fun can be had knocking a few balls around the local courts, you might want to consider refreshing your racquet skills with the help of a tennis coach. Playing with good technique means less risk of injury and a few lessons will do wonders for your confidence too. After doing any exercise it’s important to warm down and manage any problems that may have occurred. Repeating the gentle stretches you did at the beginning, ensuring you are well hydrated and applying ice to any niggles that you have developed should help prevent any minor injuries getting worse. Ice should be applied through a damp cloth and not directly to the skin and left over the sore spot for 10 minutes at a time. You may feel more sore the day after exercise, but this is normal. If your pain is severe or doesn’t go away after a few days of gentle stretching, it may be worth speaking to your GP to get some further advice or a referral to physiotherapy. Any form of exercise is good for you, so it is worth persisting if you enjoyed it. Steve Daly is an Extended Scope Practitioner with Sussex MSK Partnership East. He is a specialist physiotherapist with a particular interest in conditions and injuries to the upper limb (shoulder, elbow, hand and wrist).